Without a doubt, this parc is the most famous area of Extremadura. 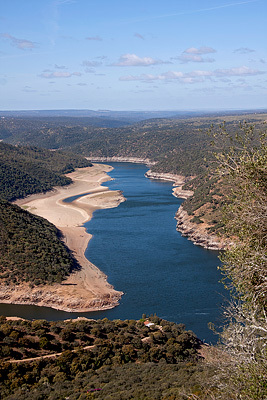 Two impressive rivers, the Tagus and Tiëtar, are dammed in Monfragüe. From the castle of Monfragüe, you have a beautiful view over the entire area. A large part of the area is shut for visitors, but two roads are open throughout the year. Several spots have been established for lovers of nature with great views. At these spots, you can be certain to find the griffon vulture and black stork. Black kites fly everywhere. Golden eagles, Spanish imperial eagles, booted eagles, Bonelli’s eagles and short-toad snake eagles can be seen with a bit of luck, and so are the black vulture and Egyptian vulture. On the rocks next to the Tiëtar, the eagle owl breeds. In the parc, many other species reside that do not immediately stand out as much. Among them are the blue rock trush, rock bunting, white-rumped swift and subalpine warbler. For hikers a couple of walking routes have been set out. It is also possible to make many observations from there. At the dam, there is a lovely picnic place in the shade. In Spring, you can see breeding griffon vultures and ravens from there. Cornalvo is situated a little south from the finca. In the parc, there is a reservoir with a lovely footpath around it. When you follow the road further up, you arrive at an observation point for birds. From there, you can drive through the dehesa on a 16 km long road. On this route, it is easy to spot all the bird species that are typical for the dehesa: the hoopoe, azur winged magpie and various other songbirds are present in large numbers. Black kites are also common like several species of eagles and vultures. Next to the reservoir you can also find the osprey. In the parc, there are several walking routes. Halfway on this hike you can find the endemic green serapias orchid. La Serena is the place to be in Extremadura for watching birds of the steppes. The great and little bustard, stone-curlew, pin-tailed and black-bellied sandgrouse all live there. You can spot the collared pratincole from the road. Many larks, calandra larks and thekla larks are to be found. Various species of birds of prey hunt on the steppes, while vultures search for carcasses in the air. Large groups of storks float on the thermals. The landscape of la Serena is also worthwile. Especially gorgeous are the surroundings of Campanario, where typical rocks mark the landscape. It is possible to combine a trip to La Serena with a visit to the large reservoirs but do not underestimate the vastness. You can easily spend all day at this place. Very different to the Serena are the steppes between Trujillo and Cáceres. The vastness of the landscape is impressive. In Spring, the steppes are filled with many various colours of flowers. Here too steppe birds can be seen although in lesser numbers then in la Serena. In the Spring and Summer, you also have a good chance of meeting European rollers. There are a number of good roads through the steppes from which you have a beautiful view across this impressive landscape. The surroundings of the Guadiana. Along the river Guadiana there are several areas that are of special interest for migrating wading birds. Especially on the flooded rice fields there is an abundance of food. From Autumn to March, huge numbers of cranes feed here. With their bellies filled with rice they fly back in huge flocks to the big lakes to spend the night. In the Spring and Summer, all types of herons that can be found in Extremadura can be seen there. Los Barruecos is a nature parc near Malpartida de Cáceres. The granite blocks on which white storks built their nests are characteristic of this parc. Nowadays the parc is famous because many scenes of “Game of Thrones” were recorded here. Take a walk at the borders of the three lakes. In earlier days the water was used to wash the sheeps wool. There is also a surprising museum of Wolf Vostell situated in the old washing house. In the parc itself, sculptures made by this artist have been placed. On your walk you will encounter small songbirds such as the Dartford warbler and Cetti’s warbler. Next to these areas, Extremadura contains many more beautiful places where special observations are to be done. Come and take a look, you will be impressed. 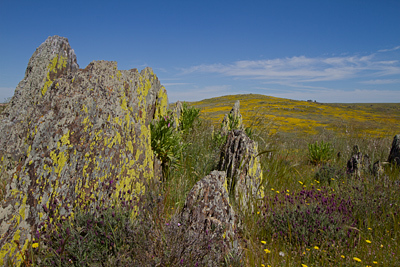 On this website you can find much more information about the nature in Extremadura.